Europe's second largest mountain range, the Scandes, extends at the western rim of the Fennoscandian shield along the Northeast Atlantic continental margin. Tectonic uplift in Paleogene (northern Scandes) and Neogene times (southern Scandes), some 20 Ma after breakup of the North Atlantic, is assumed to have triggered subsequent erosion driven uplift (with increased erosion rates during the glaciation of the northern hemisphere in Plio-Pleistocene time). Modern potential field data show a distinct gravitational deficit beneath the mountain range, although seismic investigations do not image a clear crustal root. Reduced densities in the shallow mantle could sustain present topography but geophysical constraints to confirm or discard this hypothesis are lacking. 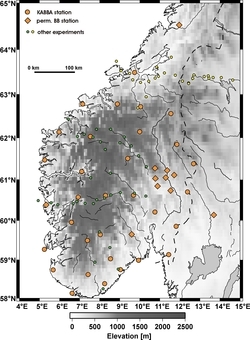 A temporary deployment of a seismological network in Southern Norway (the MAGNUS experiment: Mantle InvestiGations of Norwegian Uplift Structures) was therefore conducted with stations. This experiment improves the ground of data-based interpretation. Over a period of 22 months between 2006 and 2008, a total of 41 broadband seismometers (including permanent stations in the region) were continuously operating. Data analysis was conducted between 2009 and 2012 within the ESF EUROCORES programme TOPOEUROPE. 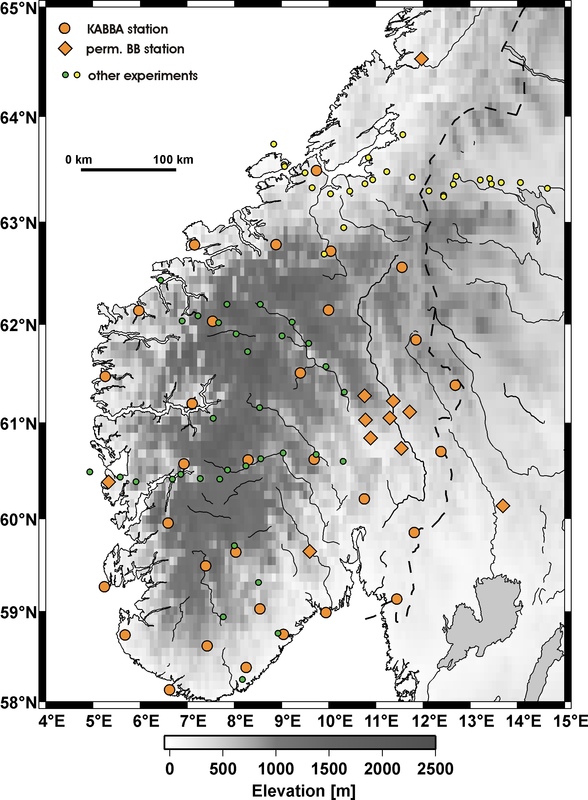 The collaborative research project “TopoScandiaDeep – the Scandinavian mountains: deep processes” developed a self-consistent geophysical model for the lithosphere asthenosphere system under Southern Norway and the mechanisms that led to mountain building far away from the plate boundary. Within the project, the results from the seismological analysis of the MAGNUS data provide the boundary conditions for geodynamic modelling.